For many of Wolf Trap’s 2018 artists, summer marks their official debut on the massive Filene Center stage. 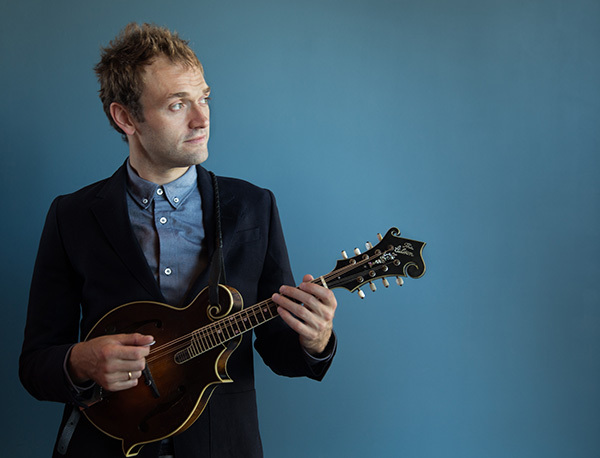 But for one acclaimed musician, Chris Thile, Wolf Trap isn’t merely a short stop on a journey of musical success—instead it’s a place that has become intertwined with his remarkable career. After making his first appearance at The Barns back in 2006, mandolinist extraordinaire Thile has continued to captivate and delight Wolf Trap audiences. Over the years, patrons witnessed Thile’s career grow phenomenally at the Filene Center—from opening for Bruce Hornsby with Punch Brothers in 2011, to performing as a guest artist with A Prairie Home Companion (APHC), to bringing his bands Nickel Creek and Punch Brothers back for stellar headlining performances. Most recently in 2017, he brought several artists together at Wolf Trap for his collaborative American Acoustic Tour, featuring Punch Brothers, I’m With Her, and Julian Lage. Chris Thile (right) with Bruce Hornsby (left) at the Filene Center in 2011. These days, Thile is reveling in finding the delight of music and spreading it to people across the world. Throughout his career, collaboration has constantly remained in the forefront of Thile’s artistry—something he does often with other Wolf Trap artists. Take a quick look at Wolf Trap’s 2018 schedule and you’ll find more than a few musicians who have worked with Thile—Alison Krauss produced two of Nickel Creek’s albums; Punch Brothers opened for Lyle Lovett; and Thile hosted John Prine, The Avett Brothers, Dr. Dog, Margo Price, and Angélique Kidjo all on Live from Here. We’re thrilled to welcome Chris Thile back for an extraordinary performance of Live from Here at the park. As you enjoy him and other amazing artists this summer, know that you might just catch the beginning of someone’s incredible music career. Who knows, you might even see the start of an artist’s journey back to Wolf Trap.